Cute and functional! These socks are perfect for small to medium breed dogs to wear indoors on cold slippery floors. These non skid dog socks are perfect to prevent sliding on slick floors, paw protection for wounds, protecting brand new hardwood floors or furniture from scratches. Also can prevent excessive paw licking or scratching due to allergies. Ideal for dogs who are in-between shoe sizes to provide a better fit. AND HE LIKES THEM! Tater Tot is a aging, arthritic very heavy Dachshund how has been housebound most of his life through several owners and I am sure that getting him more mobile will help with his joints and paw issues... this company and their products will give him a new lease on life! Thank You! I was very pleased with the customer service. Karen accommodated us with all the help we needed to get the right product. She was very prompt with emails and very pleasant on the phone. Delivery was fast. 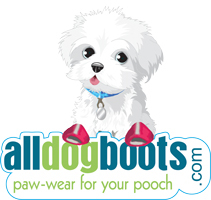 I recommend the Alldogboots to everyone with dogs. Returned for an exchange. Due to his deformed feet this may take a bit of time. to find the "just right fit". A little hard to get on but keep him from sliding all over the hardwood floors. Of course, he looks adorable in them!! I bought these for my dog a year and a half ago and I put them on my dog when the weather was bad. I loved them! I ordered another pair because my dog put a little hole in them from his nail.